After a bitterly cold sleep in the campgrounds of Mount Field National Park, I opened my tent to see the forest had become engulfed in thick fog. Excited, I grabbed my gear and raced into the forest and in doing so forgot to grab my waders so found myself standing in these freezing cold waters with the camera a few centimetres from drowning to capture this Russell Falls photograph. 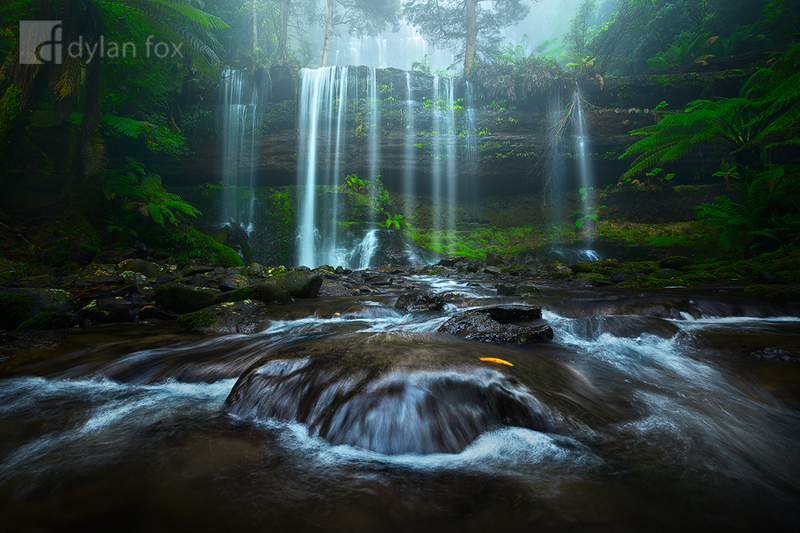 One of Australia's most spectacular waterfalls. The upper tiers are only partly visible through the fog. I just love the atmosphere a foggy morning adds to a forest scene. The little red leaf on the foreground rock showed some resilience too! I returned to these falls a week later after traveling to numerous other locations in Tasmania only to find that the leaf was still in that same spot under the water. Secure your limited edition, Russell Falls print, 'Reality Can Wait', by selecting your desired print size in the menu to the right.